Pennsylvania | Ag Moos "Growing the Land"
Dr. Carol Hardbarger is digging in and looking at all angles of PA dairy crisis. HARRISBURG, Pa. — Solving problems, bridging gaps, making connections, bringing different interests together – these are skills Carol Hardbarger, Ph.D. has been using throughout her career in education. Today, she brings a unique combination of skills and background to the Pennsylvania Milk Marketing Board (PMMB). She was appointed by Gov. Tom Wolf in May and confirmed by the Senate in June. “It is a tremendous honor for this to come at the end of my career, to be asked by Governor Wolf, to meet with Senators during confirmation, and to have this opportunity to do something for the state and the dairy industry I love,” Hardbarger said in a recent interview with Farmshine at the PMMB offices in Harrisburg. She reflects on that call from the Governor’s office, telling her she had been nominated and asking if she would serve. She promptly began looking at the information on what the PMMB does. She talks about the smaller steps that may be missed in trying to get to an end goal. “That’s how my brain is wired,” the intense, but easy-to-talk-to Hardbarger says with a smile. She is a big-picture thinker with an obvious knack for process details. In every job before retirement, she was brought in to help solve a problem and was able to deal successfully with those situations. The dairy industry issues go well beyond the regulatory aspects of the PMMB. As the board’s consumer representative, Hardbarger seeks a broader role in marketing and advocacy that is refreshing. She has rolled up her sleeves to dig in, confessing that she loves an intellectual challenge. Her intention to spend one day a week at the PMMB offices in Harrisburg, quickly became two days a week and has now evolved into a full-time 40- to 50-hour work week. Hardbarger serves on the board with dairy producers Jim Van Blarcom of Bradford County and Rob Barley (chair) of Lancaster County. They are also putting more time in their roles. She spends her time combing through records, meeting with government and industry entities, opening lines of communication, and being helpful to staff, which has been reduced in recent years by unfilled retirements. Hardbarger sees external communication and a visible, accessible board on “advocacy things” as vital for developing the relationships that lead to solving problems. She started the PMMB facebook page and twitter feed (@PAMilkBoard), as well as an email newsletter to legislators and industry that will eventually broaden to consumers. She also helped organize upcoming listening sessions. There is no need to pre-register or pre-submit comments, and the board urges those who can’t attend to send comments electronically to ra-pmmb@pa.gov. The first listening session was held Sept. 26 from 6 to 9 p.m. in western Pennsylvania. The second will be Oct. 16 at Troy Fairgrounds in northern Pennsylvania, and another is being planned for southeastern Pennsylvania, potentially in Lebanon in November. On the road forward, she sees a starting point is identifying where there is agreement. “We have to start with what we all agree are issues to address. Otherwise, we are just putting on band-aids,” says Hardbarger, explaining that such a “holistic approach” is a way for deep-rooted past, present and future issues to be addressed for the long-term. She gives the example that some are talking about “temporarily suspending” the minimum milk price, which would require changes in the law. “We told the Senate that we want to look at some legislative items and see what makes sense for 2018 and 2019,” says Hardbarger. Another example is some want the over-order premium to end. She says the board is taking a neutral approach as they look at impacts. Through facebook and twitter, Hardbarger posts things she sees every day of interest to dairy. The newsletter will eventually include a calendar, an information piece from the chairman, questions and answers by staff, and the school nutrition aspect will be discussed. She gave the example of a recent step — sending information to retailers and processors on how special milk promotions can legally be done, and suggesting such promotions be linked to PA Preferred milk. Hardbarger says she wants PMMB’s communications to be an information clearinghouse between the industry and the legislature and ultimately the consumer. In developing her role as consumer representative, she is already pursuing relationships with consumer groups and civic organizations to provide information about the nutritional benefits of consuming dairy products and what the industry means to Pennsylvania and its communities. For example, Hardbarger has already reached out to school nutrition officials with ideas about how milk and dairy are nutritionally assessed within the USDA meal profile for school breakfast, lunch and after school programs. “If milk and dairy products were separated from the nutritional analysis… we may see schools offer more milk and dairy in the morning and after school programs without having to fit into a total nutrition analysis,” she suggests, adding that this idea is being provided to Representative G.T. Thompson, who sits on the Congressional workforce and education committee as well as to U.S. Senators Pat Toomey and Bob Casey. “We are also communicating with USDA on this issue of getting whole milk (unflavored) in the schools along with now flavored 1% milk,” she said. PMMB also sent official comments to the FDA docket to enforce and uphold milk’s standard of identity, and sent emails encouraging others to do so. Hardbarger understands the nutritional tightrope schools walk to serve foods and milk that students enjoy and will consume. She is aware of the steady drumbeat of scientific studies showing dairy as a complete protein and complete source of vitamins and minerals children today are lacking, as well as the positive dietary revelations about whole milk and full fat dairy, especially for children. She remembers her youth and spending much time on her grandparents’ dairy farm in northern Maryland, of making and consuming everything from homemade cottage cheese, butter and farmers cheese to whipped cream pies. And she reminisces about doing just about every chore on that diversified farm, pointing out a decades-old framed photo of her son as a child milking one of four Jersey cows the family kept at that time. While her career has been in education and technology, she is quick to point out that she has been around farmers and agriculture all of her life. “There is a passion people have for this life, this business. And the dairy industry is vital to the economy of our state and a big part of what defines us, of who we are,” the proud mother and grandmother two-generations removed from dairy farming explains. Since her first day on the PMMB in early July, Hardbarger has encountered “no real surprises” but a fuller understanding of issues that have swirled for years. What surprises her is “the differences of opinion among constituent groups and their differing opinions about what needs to be done,” and seeing how far the industry is from dealing with differences over coffee and a handshake. From staff development to planning a staff retreat, to emailing staff for their ideas, Hardbarger says the momentum is “forward,” even though it’s “frustrating” to learn that state bureaucracies do not move as quickly as desired and there are regulations for literally everything. “We can’t” are words she does not like to hear. Toward that end, Hardbarger says her next goal is to have the PMMB work with other agencies in forming a “rapid response team” for dairy. CONESTOGA, Pa. — The number one problem needing solved for dairy is bringing back fluid milk demand. Good things are happening in the dairy industry, which makes now the critical time to seek ideas, think outside the box, and be open to seeing — and seizing — opportunities. That’s what came through during a recent interview with Rob Barley in his office at Star Rock Farms. The Lancaster County farmer and dairy producer is having a busy summer as the new chairman of the Pennsylvania Milk Marketing Board (PMMB). He is also the first dairy farmer to be appointed by USDA to the at-large general public seat on the National Fluid Milk Processor Promotion Board, which funds the Milk Processors Education Program (MilkPEP) for educating consumers and increasing fluid milk consumption. July brought a changing of the guard and a fresh spirit of optimism and forward-looking energy to the PMMB with the June Senate confirmation of both Barley and Dr. Carol Hardbarger, who join Jim Van Blarcom on the three-member board. While Barley wasn’t actively seeking the appointment, he was often been called upon to give a dairy producer’s point of view at House and Senate hearings over the past 10 years during his previous involvement with the Dairy Policy Action Coalition (DPAC). “There was a clamor for change, and people were encouraging me to consider a PMMB appointment,” he says. People were vocal about it. Fellow dairy farmers asked Rob to get involved, and the support of Senators Scott Martin and Ryan Aument of Lancaster County, as well as the Senate leadership, was instrumental. Once it became clear there were two openings for board terms that had expired without re-appointment, Barley had discussions with Pa. Secretary of Agriculture Russell Redding and was honored when the Governor appointed him in May. Now, just a month after being confirmed by the Senate, Barley says he is getting a feel for the PMMB’s regulatory function. At the same time, he wants the board to exercise a leadership role in the collective efforts underway to strengthen Pennsylvania dairy. That process of idea-gathering began with Secretary Redding’s letter to the previous board in April, followed by the previous chairman, Luke Brubaker, holding several open hearings for public comment. Barley wants to keep that momentum going. In addition to spending a day or two each week in Harrisburg with staff, he has been reaching out in person and by phone to talk with people from all facets of the dairy industry. He wants to understand the landscape of what’s being done now, and take-in ideas from others about what can be done going forward. During the July 2 hearing and sunshine meeting, the first for Barley as PMMB chair, the enthusiasm was apparent among board, staff, industry participants and onlookers as the reorganized board is challenging everyone to bring forward ideas. The PMMB is also engaging the Pa. Department of Agriculture, Center for Dairy Excellence and the PA Preferred program. “There’s a limit to what we can do from a regulatory side, because our job as a board is fairly narrow, but we can show vocal support and leadership, and if we see something we can do that can help, we can consider it, or make suggestions to the legislature,” Barley explains. In fact, the Senate Ag Committee encouraged Barley and Hardbarger to do just that during their confirmation hearing. Senators said they wanted to keep dialog going and see ‘marketing’ put back into the meaning of the Milk Marketing Board. Barley sees real opportunity in Pennsylvania. And while the multi-part Pennsylvania Dairy Study shows the Keystone state as a good bet for new processing, he realizes new plants are costly, and attracting a new processing plant will take time. “We are competing with other states that may have more incentives or more sites, but we have the milk and the infrastructure and the quality and the people, and we can overcome some of those challenges by looking at new opportunities with existing plants,” he suggests. Discussions are already happening with existing fluid milk plants in the industry around ideas for expansion associated with re-tooling and innovation. “The normal market for fluid milk is not expanding, but maybe we can offer other ways for consumers to enjoy milk,” says Barley. Working with businesses already located in Pennsylvania, with a commitment here, could be a less expensive and faster course of action to get accomplished versus attracting a new plant or new business to the state. That’s how Barley thinks. He thinks in terms of opportunities and how to capitalize on them, and in these new roles, he is using those skills to strengthen an industry he cares about and bring that to the farm level. “I’m excited to finally see some good things happening in dairy,” he cites the recent University of Texas Health Science Center published July 11 in the American Journal of Clinical Nutrition. It shows the clear health benefits of enjoying full-fat dairy products and whole milk. Barley is also is encouraged by FDA’s recent move to look at what actually is milk. In both appointments, Barley is focused on fluid milk demand. Pure and simple, he considers it job number one. His bottom line is that doing the right thing is something no one should be afraid of. A story interview with the new PMMB consumer representative, Dr. Carol Hardbarger, appears in Friday’s Sept. 7 Farmshine, beginning on page 3. This one will also be posted at this blog in the future. Secretary of Agriculture Russell Redding congratulates Karen Hawbaker, 2018 Distinguished Dairywoman. Karen’s humble courage and work at her own Warm Springs Dairy as well as the dairy at Andrea’s Homes of Hope and Joy in Bolivia through of Love In Action Ministries is an inspiration. This is a small world. I met Karen six months after meeting my daughter-in-law Vanessa’s father who put me in touch with his brother David Rice in Nebraska for a stop to visit Prairieland Dairy on my working travels west. David told me about having volunteered in the project to build a dairy at the orphanage in Bolivia. He put me in touch with LIAM, and six months later, back in Pennsylvania where it all started, I met Karen and other project members to do this Nov. 27, 2015 Cover story in Farmshine, which was later reprinted in additional publications. STATE COLLEGE, Pa. — A humble and honored Karen Hawbaker showed her faith and gratefulness as she was presented the 2018 Pennsylvania Distinguished Dairy Woman Award by the Pa. Dairymen’s Association, Center for Dairy Excellence and Professional Dairy Managers of Pennsylvania during the Pennsylvania Dairy Summit here at the Penn Stater Conference Center Feb. 21. “Without God’s strength, provision and blessing, I wouldn’t be who I am or where I am today,” said Hawbaker, thanking also her crew at Warm Springs Dairy, where she owns and operates the 180 cow dairy she and her late husband Rodney started in 1988 in Franklin County. The award recognizes a dairy woman who has distinguished herself in her leadership and service to the dairy industry, both on the farm or to the broader industry and community. Warm Springs Dairy has been recognized for numerous production awards, consistently being in the top DHIA herds for production and milk quality. Since Rodney’s passing in 2011 from a farming accident, Karen has continued to operate the business with her dedicated employees and a focus on the cows, with custom operators doing most of the field work. Through Love in Action Ministries (LIAM), Karen has been able to share her dairy passion and her faith and has been instrumental in carrying on her husband’s legacy in helping LIAM establish a dairy farm at Andrea’s Home of Hope and Joy, an orphanage in Bolivia. The LIAM dairy project was started by Rodney as a plan to build a dairy in support of the orphanage. After planning the farm, Rod and Karen led fundraisers to build the dairy and then traveled to Bolivia in 2009 for the start of the barn, traveling there three other times before Rod passed away in 2011. The project was delayed at that point, but cows arrived in the fall of 2014 and are doing well, with the farm providing milk and vocation for the children who live there. Karen has served on the LIAM board and its dairy committee and loves the opportunities to volunteer her time to work with the farm in Bolivia. In addition to her involvement with LIAM, Karen is a member of Antrim Brethren in Christ Church where she teaches fourth grade Sunday school, leads a grief support group and helps with audio visual ministry every other month. Day 11: “He was born in a stable, the Lamb of God, and laid in a manger with shepherds the first to see Him. Understanding the significance of Jesus’ birth will be part of The Star Barn’s future… God is into resurrection and restoration, and that’s what we’re going to do in order to use these buildings to be shared with others.”– David Abel. Read on to learn how restoration and hope bring together The Star Barn, Ironstone Ranch and Brittany’s Hope. ELIZABETHTOWN, Pa. — If you’ve traveled from anywhere in the U.S. to the Farm Show Complex in Harrisburg, Pennsylvania, you’ve no doubt passed The Star Barn — one of the most painted and photographed barns in the U.S. This historic landmark has languished and deteriorated for years in a quest for funds for a proper restoration of the icon from the 1800s. Enter David and Tierney Abel of nearby DAS Companies Inc. who have purchased The Star Barn and will use their own money — no grants or tax dollars — to restore it all, after first moving it to their Ironstone Ranch, 10 miles away as the crow flies in Elizabethtown, Pa. The former dairy farm, turned fruit farm, turned Christmas tree farm, is now an “events with a purpose” reception venue that will be the new home for all nine buildings of the original John Motter Star Barn — including a rebirthed replica of the original farm house, pond and springhouse that were removed in the early 1970s when Route 283 was built right through the property on which they sat. My connection to this story began when our middle son Ryan Bunting married our new daughter-in-law Vanessa Rice — daughter of Vernon and Jeanette Rice of Strasburg — at Ironstone Ranch on October 12, 2015. The bride and her attendants prepared for the big event in the original 1812 farmhouse the Abels first restored on the 150-acre farm. 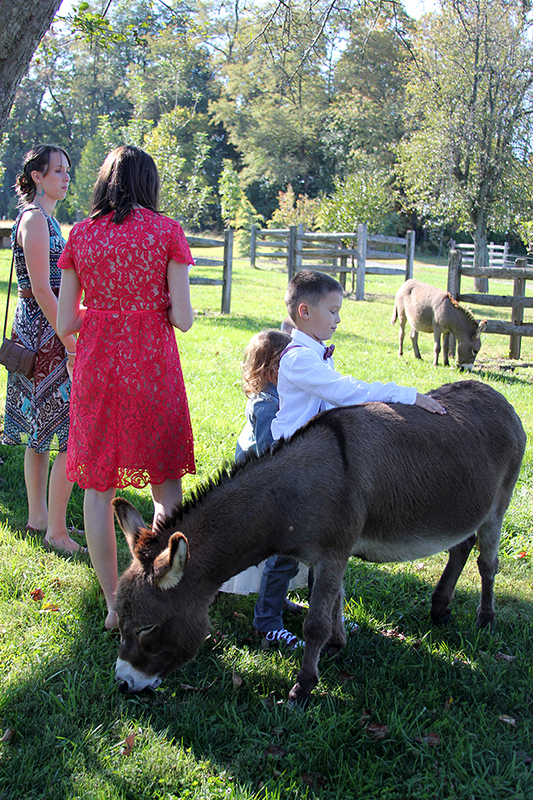 The wedding was in the orchard with two roaming miniature donkeys photo-bombing the ceremony. And the reception was held in the beautifully restored 1860 pine and brick barn original to the premises. While in the orchard doing family portraits between the wedding and reception, I learned from my 95-year-old grandmother Dorothy Jacobs, who still lives just across the street from the Ironstone Ranch at the edge of town, that my grandfather Bernard “Ace” Jacobs, a friend of an earlier owner, hunted there every year. Yes, it’s a small world. As the wedding party, which included 12 children — the largest number of children ever in the four years of 80 weddings per year at Ironstone — prepared for their grand entrance, the farm’s manager Mark Shoemaker told wedding guests about Ironstone Ranch and its mission. Children are at the center of Brittany’s Hope Foundation, which receives all net profits from Ironstone Ranch. These 12 children in the Bunting-Rice wedding party in October received the royal treatment from the folks who run the reception venue and ranch. In fact, chief operating officer Mark Shoemaker handed a cowboy hat to Connor Messner, 6, (my grandson) for instant confidence as he escorted Lydia Rice, 8, as the lead-off pair in the reception at the 1860 pine barn restored on the premises. With a skeleton crew of seven full time and two part time employees, a stable of carriage and pleasure-riding horses, a few Longhorn cattle and the mascot miniature donkeys along with 250 acres of grazing, hay ground and wooded riding paths, 100% of the net profits from weddings, corporate events, and other meetings and entertainment are funneled into Brittany’s Hope Foundation. Named for the daughter the Abels lost in a car accident 16 years ago, Brittany’s Hope facilitates adoptions of primarily special needs children from around the world and also funds orphanages in many locations, especially Viet Nam, Kenya and Ethiopia. To-date, Brittany’s Hope has facilitated over 900 adoptions. David and Tierney, themselves, have 17 children in their blended family, 12 of them adopted. So what has this to do with The Star Barn? Plenty. There were plenty of hoops to jump through from the purchase and permits to the logistics of moving, and even getting permission to keep The Star Barn on the historical registry at its new location. The Ironstone Ranch is currently completing the restoration of an old 1812 barn moved there from nearby Bainbridge. At the DAS Company warehouse, home of Stewardship Missions a few miles away, the dismantled iconic 65-feet-tall, post-and-beam 1819 antique barn with its Cathedral architecture that sat for centuries along what is now Fruitville Pike near downtown Lancaster, lies bound in cataloged clusters under a coverall waiting its turn for restoration at Ironstone Ranch. But the focus right now is The Star Barn. The work to bring the 9-building complex to its new home for restoration began October 27, when the cupolas came down, the main cupola weighing 13,900 pounds! They are being restored to their former glory, with the main cupola expected to take 18 months, including hand-forging of new weather vanes as they were in the 1800s by craftsmen in Rhode Island. This 13,500-lb cupola is the distinctive main cupola of The Star Barn and will take 18 months to restore, including the hand-forged weather vanes being recreated in Rhode Island to their original 1800s design. Later this year or early in 2016, the barn itself will be moved to Ironstone Ranch. Piece by piece, it will be taken down and cataloged, then pegged together and raised manually with gin poles just as they did in the 1800s. Tickets for this event are expected to be available on a limited basis for those who want to see The Star Barn raising. This story gets even more interesting. David Abel explains how The Star Barn cupolas have the fleur-de-lis pattern, representing the Trinity and the sovereignty of God over every building. Furthermore, the stars on the barn were placed there as a sign of hope for the nation after the Civil War. “God is into resurrection and restoration, and that’s what we’re going to do in order to use these buildings to be shared with others,” he said. The nine buildings of The Star Barn complex will be placed as in their original setting with the three-fold purpose of being a working farm, an event venue raising funds for Brittany’s Hope, and a living parable for visitors to visualize many of the agriculture-based parables of Jesus. It will include a thrashing floor, oxen, sheep and goats, a vineyard and 1800 time-period antique farming equipment the Abels have begun to accumulate for working the land. Not to mention, when all the barns they are in the midst of restoring are completed, Ironstone Ranch will become a destination where visitors can see 1800s German agriculture practices and architecture with historical and biblical significance. The Abels anticipate the process of restoring the entire Star Barn complex to take two years, including the re-creation of the original pond, farmhouse and springhouse. For these portions of the complex, they will use pictures and time-period catalogs to make replicas of the original structures. The house will become a 12-bedroom structure to provide lodging for special events. Mark Shoemaker and his wife Jamie once operated a hay and horse farm in Schuylkill County. Today, they manage theIronstone Ranch. “When Mark and Jamie came into our life, they made it their goal to make the property beautiful. It’s ours to share with others. God put us together and they’ve put their heart and soul into this,” said Tierney. “God is weaving a tapestry here,” David added as they talked about their plans for the ranch, the Star Barn and Brittany’s Hope. While the Ironstone Ranch is set up as a for-profit corporation, all profit after operating costs goes to the non-profit Brittany’s Hope Foundation, created in January 2000 for the purpose of advocating for orphaned special needs children longing for the love of a family. At the 100th Pennsylvania Farm Show in January, Ironstone Ranch will have a booth near the butter sculpture where they will display The Star Barn 1/12th scale model layout for the “living parables” farm. “God gives each of us gifts, and one of David’s is vision,” said Tierney. David Abel started DAS Companies in the late 1970s with $200 selling stereos and CB’s at Lancaster County’s Roots and Green Dragon markets from the back of his father’s station wagon and the garage of his grandmother’s home. Today, DAS Companies is a global supply chain with many lines of products in truck stops all over the country. The business fuels the stewardship and mission they have undertaken. Horses graze in mid-November at Ironstone Ranch. This hayground will become the new home for all 9 buildings of the original Star Barn. It will remain on the National Registry of Historic Places at its new location, which has its own historical significance. During the Civil War, this was a staging area for troops, and after the war, the Liberty Bell traversed the land on its way back to Philadelphia from Harrisburg, as did President Lincoln’s funeral train as it passed between the two cities. A Christmas event at Ironstone December 5 raised thousands for Brittany’s Hope and the Water Street Rescue Mission. Stay tuned for more on The Star Barn from the 100th Farm Show in January.